Is it cheating to include this car in Toyota week? After all, the Toyota Lexcen was built in the same Elizabeth, South Australia factory as the Holden Commodore on which it was based. The only differences were cosmetic, although the Lexcen kept things simple: there were no manual transmissions, V8 engines or sporty trim levels. Why on earth did this bizarre rebadging experiment exist, and why was it sold for 9 long years? The answer to the second question is one that remains elusive. Despite being almost identical to a car that was regularly Australia’s best seller and despite being sold by a brand that became #1 in Australia many years ago, the Lexcen sold poorly. And yet, Toyota kept it around. The Lexcen was a product of the United Australian Automobile Industries joint venture between Toyota and General Motors-Holden. This joint venture also produced Holden-badged Toyota products, the Corolla-based Nova and Camry-based Apollo. Despite Holden’s extensive dealership network, the Camry and Corolla outsold the badge engineered Holdens by around 4-to-1. This badge engineering wasn’t exclusive to the UAAI cars, as other local manufacturers like Ford and Nissan got involved too. They had been motivated by the “Button car plan”, an Australian federal initiative to consolidate locally-manufactured cars under fewer platforms, reduce tariffs on imported cars, and generally encourage competition and help improve Australian-built vehicles. With its so-so build quality and pushrod Buick 3.8 V6, the 1988 VN Commodore was markedly different from any Toyota. The closest thing Toyota had was the rear-wheel-drive Cressida, but it featured a smoother 3.0 double overhead cam V6 and was priced much higher. Certainly, the “big Aussie six” was a popular format and the Commodore and Ford Falcon were consistently Australia’s best-selling cars. Perhaps Toyota wanted to get a piece of the pie considering its Camry was rather diminutive in size next to the Commodore and Falcon. Named after the designer of the Australia II yacht that won the America’s Cup, Ben Lexcen, the Toyota Lexcen was priced almost identically to the Commodore. The name was a confusing and misguided choice considering Toyota was launching its Lexus division around the same time. The Lexcen sedan and wagon came in base, GL and GLX trim; these designations would later make way for CSi, VXi and flagship Newport sedan trims. Toyota’s advertising proclaimed the Lexcen was for a different kind of family, despite the fact that the only real differences from the Commodore were the grille and headlights. The “wide-body” Camry that arrived in 1992 pit the Camry much more closely against the also new and larger Mitsubishi Magna (Diamante) and the Commodore and Falcon. With a bigger and more powerful 3.0 V6 available, sold as the Vienta to create psychological distance from the four-cylinder only Camry, the Lexcen was more redundant than ever. Despite this, Toyota persisted and even afforded the T2 series some further cosmetic differences from the VP Commodore on which it was based. The T3 and T4 series Lexcens (VR and VS Commodore-based, respectively) were also visually differentiated with unique front fasciae. Despite this, the cosmetic differentiation was barely noticeable at a glance. By the time of the T3/T4 Lexcen, the cheapest V6 Vienta was priced a cool $3k above the rebadged Holden. The Falcon and Commodore had been duking it out during the 1990s for the top sales spot, but the questionable styling of the 1998 AU Falcon and the all-round competence and attractiveness of the 1997 VT Commodore tipped the scales very much in Holden’s favor once again. One wonders if Toyota was ever in line to get a Lexcen version of the hot-selling VT. Instead, with the UAAI experiment over, Toyota developed its own “big Aussie six” for 2000: a rehashed ’94 Avalon that flopped badly. It was plain as day, even to non-enthusiasts, that the Lexcen was a rebadged Commodore. Were buyers loyal to their Toyota dealerships but needed something that towed more than a Camry? Were there better deals to be had on the slow-selling model? Former or current Lexcen owners, are you out there? Inquiring minds want to know why you didn’t just buy your car at a Holden dealership. Wow, take one somewhat anonymous looking sedan…..and somehow make it MORE anonymous looking. And that name, even though it’s named after a real person, if anything ever sounded “made-up”/fake it’s Lexcen. The T3-T4 looks vaguely like a Chevy Beretta with Impala overtones. In the U.S. a GM product “cloned” from a Toyota did okay, saleswise. But a Toyota “cloned” from a GM product sounds dubious. Sounds like someone never heard of the Toyota Cavalier. 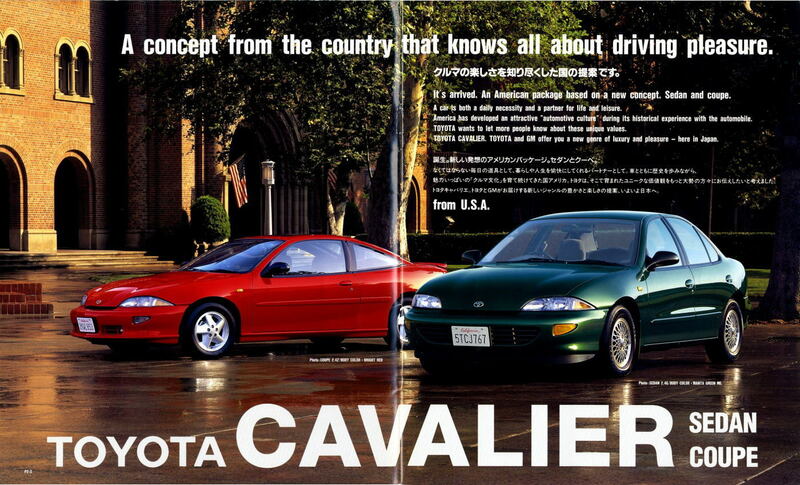 As an American I take offence at the thought of the Chevy Cavalier representing the ultimate in luxury and driving pleasure…. I love that commercial, it is hilarious! The tagline – “Oh, what a different feeling, Toyota!” is a great riff on the regular line. Not sure if t would have helped to sell the car but certainly catchy. I think it’s still more appealing than the Toyota Cavalier sold in Japan though but perhaps that’s due to greater familiarity with the Cavalier than the Commodore. FWIU the GM-branded NUMMI cars sold over the years because of better deals and GMAC financing than you could get on the equivalent Toyota. Thanks to the American obsession with financing everything, the latest looming subprime bubble is now auto loans. People will let practically everything go before they stop making their car payments. No car, no way to get to work. You can live in your car but you can’t drive your house to work. Even if they don’t, repo’ing ad reselling a car is quite a bit easier than foreclosing on a house. Subprime is very profitable for cars and low risk, the risk is already built in to the interest rates and pays for itself quickly. It’s safe to say he wasn’t the brightest match in the box. The ex-wife had one of the VN Lexcens. What a dreadful car! A/C kept dying, main fuses, ignition module, door locks, just a poorly built heap and a reminder of the bad old days of Aussie cars. I don’t know whether to be impressed with the car or not. It’s attractive, and I’m hoping still built to Australian road driving conditions. But whether to call it a Holden or a Toyota, that is the question. It looks more like a Holden Commodore than a Toyota. A family friend, who knew everything about everything, bought a VP Lexcen over the Commodore because he was convinced that all Toyotas were made in Japan. Sure enough it slowly started to fall apart but fortunately for him it was stolen and never recovered. The OZ warranty wars began after these cars faded away led by Hyundai ever increasing warranties were offered on Australian cars, it led to extended service intervals that cost consumers a small fortune on just out of warranty used AU Falcons when they found the transmission 100k service interval if neglected cost them a rebuild at 110k kms, Hyundai didnt care their cars mostly lasted the 3 year warranty unscathed if the owners took advantage of the free servicing offered if they didnt it voided anyway and Holden and Falcon drivers just took a punt on local build quality as always. That would be the 1986-1994 Opel Omega A.
I had no idea these continued into VR and VS series. One sensible improvement Toyota made was to fit proper amber front indicators, rather than the feeble clear-lens Holden units that are invisible in bright sunlight. I always wondered if these would have sold better with proper Toyota engines. Lexus V8 in a Lexcen, anyone? I remember looking at a lone Lexcen sitting in a Toyota showroom next to a bunch of regular Toyotas and being transfixed by the difference in build quality. The Lexcen was clearly the cuckoo in the nest. Standing prouder but rougher than the rest of the clan. The contrast between the appalling build quality of the Holden sourced interloper and the imported cars was both stark and cringeworthy. I had a lexcen identical to the green T3 in the pictures. I chose it purely because it was cheaper than an identical coloured Commodore the dealer had on the same lot ( both cars were about 17 years old at this time). The differences extended further than just the grille – the front fenders/wings/guards were also restyled to accommodate the indicators on the lexcen that extended further back. Not a great car but not neccessarily a bad one. The VR and VS commodores do seem to have a very high survivor rate. What I’ve never understood was why Toyota choose the Holden Commodore to rebadge a Toyota? Not being from Australia, I don’t quite understand it. But from what I’ve read so far, by this time, Holden build quality has been deteriorating. I would think that rebadging the car as a Toyota would not do Toyota any favours, but would bring Toyota down a notch in quality. I would guess Holden was chosen by Toyota because GM and Toyota already (?) had a “similar” tie-up….or would have a similar tie-up in the U.S.
That, and Ford U.S. had tie-ups, or again would soon have tie-ups with Nissan in the U.S. and Australia. I reckon in a way that makes sense. Apart from being newer, the VR & VS Commdores were a much better car. The VN was pretty flimsy; the VR Commodore was over 60kg heavier when the main non-bodyshell changes were a new front suspension and driver’s airbag, along with a new upper section of the dashboard, so you can see there must have been a decent amount of extra metal incorporated. The VN Commodore weighed 1310kg/2980lb which is pretty light for a 4.85m/191″ long car. The Holden Commodore has been an Opel derivative since the very first generation, so the resemblance is no coincidence. Only exception, interestingly enough, is this latest generation, a completely clean-sheet design, said to be the last. I always wondered, though, why GM was never able to expand the Commodore’s market to keep the line going. They gave it a red-hot go! In the early 2000’s the Commodore was sold on every continent except Antarctica. Both the 1996 VT and 2006 VE/Zeta generations were under serious consideration for production in the USA, the closest it got was the Zeta-based Camaro. The decline of the sedan market and a few percentage disadvantage for fuel consumption compared to a fwd driveline mean that we won’t see an Alpha-platform based replacement. Its like the Honda Odyssey/Isuzu Rodeo situation. They swapped a rebadged Camry for this car during those years. The Button plan still kind of confuses me. I know the US Government imposed some very specific restrictions on GM as conditions of the bailout a few years back, but it seems meddlesome that the government decided “what we need to do is tell the carmakers to consolidate platforms and force tie-ups with Japanese manufacturers.” Just odd.